A while ago some folks asked me, if it’s possible to use NativeScript and Angular with Android Wear. tl:dr; It’s possible, easy to setup in 5 steps and with FlexBox in NativeScript you can even handle small screens. I hope you already installed NativeScript and the Android SDK on your machine. If not you can follow the instructions from NativeScript. Now we start the emulator from inside Android AVD (“Start …”) or via CLI. The reason is, NativeScript looks for an already opened emulator and deploys the app there. 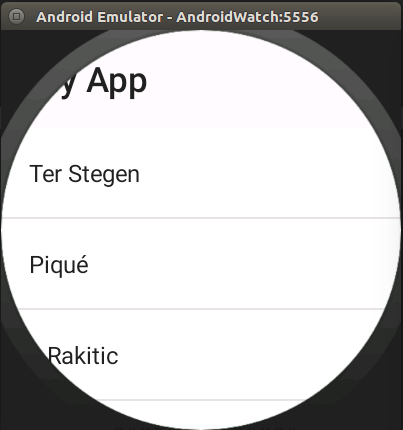 It should deploy the standard NativeScript, Angular App on your Android Wear emulator and look like this. Now you have your first Android Wear app build with NativeScript. Congratulations! To proof the functionality, I build a little app showing the actual time in NYC, Berlin and Tokyo. I’ll be using Moment Timezone to get the time for each location. You can find the final version of the clock at GitHub. The layout is based on FlexBox so, it can handle the various screen sizes and rotations best. There is only one screen and it should show the city name and the actual time at that location. In the final app this container is packed into another FlexBox layout, so we can add arrows to switch between the cities and add gesture control. While this works very well on a normal Android emulator, there may be some issues on Android Wear. In your component just add a reference and animate the element on a tap or swipe. Now you have your first own App running on a Wearable and using the basic functionalities of NativeScript.